Bernie Sanders is an incredible man. I recently took one of those quizzes on Facebook, which try and match you to the candidate who most closely aligns with your opinions and shares your same values. I got Bernie Sanders at 98%!!! That’s higher than anyone else I know. I look at his views and proposals and really see someone I can relate to. He does indeed share my hopes and dreams for this country. I think Bernie Sanders is right for America. I just don’t think America is right for Bernie Sanders. Because Bernie might be right for this country, but far too left for its people. Bernie Sanders calls himself a Democratic Socialist. He might as well have said he was an ISIS Communist. America simply does not trust anything with Socialist in the title. I’m not saying I agree with this notion. On the contrary, I actually like a good deal of socialism, and think it would solve many of this country’s urgent problems. However, my views are not the opinions of mainstream America. Although we’ve had a momentous week, with Marriage Equality passing and the Affordable Care Act being upheld and protected, don’t think we are anywhere close to being a progressive nation. As many of us were thrilled and relieved to have won equality for gays and lesbians last Friday, nearly 50% of this country was in shock and disbelief, as they felt their core values had been betrayed and the sanctity of marriage had been dealt a crushing blow. THAT’S the country we live in. It is deeply divided, and that is why it is absolutely imperative that we run candidates who can appeal to both parties, or more specifically, those in the middle…the swing voters and independents, who vote both ways, and need to be convinced that we have their best interests at heart in our party. Many of them lean a certain way, but are still undecided and hesitant. They need gentle coaxing, and need to be convinced. This can only happen with a candidate whose message and platform is more aligned with the middle, and is a moderate progressive, with Main Street America values, and a willingness to work with the opposite party. He can’t be an extremist or firebrand, who invites the scorn and criticism from the Right and the distrust of middle America. He can’t be Bernie Sanders. As I’ve said, I like Bernie Sanders, and I think he shares my values and has a clear idea of what America should look like. I share this vision. However, we have different ideas about how to achieve these goals. Bernie wants to barnstorm the nation, overtake Hillary, and win with a clear and overwhelming mandate from the people. In office, he hopes to enact unprecedented sweeping change, and start making America a country which serves all its citizens, not just a few privileged whites at the top. I love the idea of Bernie, I just can’t see that happening. If a relatively moderate President like Barack Obama can’t get most of his legislation passed, and has faced unprecedented opposition and bitter personal enmity from a Republican held Congress, Sanders would really have no shot of getting anything done. His far left extremist views are scorned and ridiculed by the Right, and they would defy his rule even more than they have Obamas. When I say that I’ll vote for Hillary if she makes the ticket, even though I seriously like Bernie Sanders and agree with his policies, I am not “selling out” or “settling,” but simply hedging my bets, and aligning myself with a winner. The end game is everything, and I’m in it, to win it. That sometimes means you can’t wait around for Mr. Right, but rather, take home Mr. Right now. Because he — or she, as the case may be — is there right now, and has the best shot of winning. What some may call ‘settling’ I call ‘compromising’ and hedging your bets. Why? Because we had to “settle” for George W. Bush for eight years, two wars, thousands of lives, billions of dollars, irreparable damage to the environment, the appointment of two SCOTUS justices, the squandered good will of the world, and countless legislative damage and attacks on women, minorities, and LGBT rights. All because a large enough number of liberals decided to vote their conscience, and cast a vote for Ralph Nader. Sure, Sanders isn’t a third party candidate, so he’s not going to steal votes from Hillary, but we still have to treat him with skepticism. Is it jaded and less than ideal? Yes. But it’s also realistic and pragmatic. In order to beat the Republicans, we have to start thinking like them. And taking a page out of their playbook. Do you think the majority of Republicans wanted Mitt Romney as their next Commander in Chief? Probably not. But you’d never know it, because those people know how to win and organize, and get out the vote. They come together, because they smartly know this is bigger than one man or one woman. This is the future of the party and the country. They supported Mitt because he was Republican enough to get ‘er done! Liberals shoot themselves in the foot over and over while they dream of electing the next Martin Luther King, Jr. but refuse to understand that we must throw our support behind who’s most electable. So yeah, in the REAL world, it’s always about choosing the lesser of two evils, if you want to phrase it that way. I’d prefer to say the one with the broader appeal and the more competitive edge. We have to keep in mind that we’re not just nominating a candidate that satisfies all us lefty liberal socialists, and embodies every single one of our hopes and values. Of course, that should always be the aim. Realistically, we’re just trying to get one of our guys in the White House, and once there, can let down their hair and get on with the liberal agenda. At this point, we’re putting forward a candidate not just for us, but for that guy in Ohio who has never voted Republican before, but just doesn’t feel comfortable with Bernie’s views on gun control and what he calls the “socialist agenda.” He doesn’t know if he’s on our team yet, but we know he’s not on the Right’s. He’s ostensibly a Democrat, but spooks easily. Sanders doesn’t live on Main Street, U.S.A. Many are alienated by the stereotypical and much maligned lefty liberal. Sanders embodies this image: a well educated rich elite liberal, New York Jew and Vermont transplant, peacenik-hippie, drives a Volvo, self-described Democratic-Socialist, fervent environmentalist, aggressive in taxing the wealthy, anti-business, outspoken social activist, anti-gun, pro-union and co-ops. and the list goes on. While all of these things sound good to me, they tend to alienate the mainstream, and we lose voter confidence. We need to win the hearts and minds of these swing and undecided voters. Whether you choose to accept it or not, Bernie Sanders is not in the mainstream of American culture, as much as I wish we lived in that country. We have to accept that change comes from within, and the only way to get IN the door is to be at least a little bit moderate and attractive to middle of the road voters. I’m not suggesting a candidate adopt the Republican platform, and give up on the core beliefs and values cherished by liberals everywhere. I’m simply saying that whether I like her or not, Hillary is more of an electable centrist and a far stronger and viable candidate than Bernie Sanders. At least right now. If he keeps barnstorming the country and gaining support, his momentum could carry him all the way to the generals. If that were to happen, I still don’t think he’d beat a more moderate and appealing Republican like Jeb Bush. The only person I could see beating Jeb right now, is Hillary. I don’t have to love HER, but I have to love the party enough that I compromised and accepted a second choice winner over a first choice loser. I don’t think it’s cowardly or dishonest to compromise. That’s what life and politics are about. We simply cannot afford a Bush III Presidency. If that means Bernie takes one for the team, then so be it. Roe v. Wade lives to see another day. And gay marriage continues to be the law of the land. We’re running a marathon here, not a sprint, and we’ve got to prepare for the long game. Or else the Right beats us every time! I didn’t make the rules of the world, but I acknowledge they exist. I can vote my conscience and feel good about my vote, but gutted about the fact that I just voted a third Bush into office. My problem with some liberals is that they plan for a world that they’d like to live in, whereas Republicans acquire what they need to exploit and profit from the world that we’re actually in. Liberals dream of the ideal America, where everyone is included and valued, whereas Republicans live in their ideal America, and do whatever it takes to preserve it and ensure it doesn’t change. They even takes steps to turn back the clock, and take away hard-won freedoms, and reverse the progressive course of history and our evolving nation. They make no apologies, and they rule with an iron fist. Because Republicans feel they are governed and guided by a higher power, that ensure their victory, and they make decisive decisions based on a black and white absolutist interpretation of right and wrong, and how the hierarchy of this nation and world should work. There’s a pecking order in the GOP, and it’s a survival of the fittest, dog eat dog world. Ironic, considering their views on Evolution. The point is, where Democrats apologize and feel bad about stepping on feet and speaking up for what they need and believe, Republicans will step all over us, and not feel remorse or regret for their actions. They know they’re doing God’s work. We think we’re doing the work of the people. Don’t get me wrong. We need dreamers and visionaries like Dr. King and RFK. They had a vision of a better tomorrow for blacks and whites, women and men, and everyone under the sun. That kind of prophetic forward thinking fueled the Civil Rights movement and the recent Marriage Equality victory. That’s the heart and soul of the Democratic party, and I would never suggest we leave those ideals behind. All great change begins with a dream. But we also need practical thinkers, who can compete with Republicans, and bring the fight to them. We need team players, and if that means insider career politicians, then so be it. This party could use more pragmatism, and short and long-term strategy. We could learn a lot from the Republicans. As much as I would like to see him do it, I personally don’t think Bernie Sanders is likely to storm the White House and enact sweeping change across America. His politics are simply not digestible to many Americans. The ones we need. The middle. We still share this nation with another 50% who vehemently oppose most of what we stand for, and the future we envision for our children. And as they have proven, they will do WHATEVER it takes to maintain the status quo and ensure their conservative agenda. They’re a machine over there, and they stay on message. The Republican Party is a dependable brand, and a known quantity. Voters know what they’re getting. And those people…we don’t need their votes. They’re gonna vote for the Right no matter who we run. It’s all of those others, who are good, decent, hard working Americans, who see the virtues and pitfalls in both sides, and simply need to be convinced. Is this strategizing and compartmentalizing good for American politics? Probably not. But nobody sitting on the front steps of the Capitol ever crafted and passed legislation, and no one outside the front gate of the White House ever signed it into law. Like it or not, you have to first sit down in the chair, before you can stand up for what you belief in. You have to win it, to begin it. The dilemma is this. Pragmatists like me are considered by many in my party as jaded, a slave to a broken system, and mercenaries willing to sell out their values to play in this game of political bloodsport. Without the infusion of new voices and fresh hope, there is no possibility for change and a more peaceful and loving society. While this theory sounds legitimate in the abstract, in the practical world, things aren’t quite so black and white. We live in a world of shades of grey, and where strategy, deals, and compromise wins elections. Look no further than another Vermonter — Howard Dean to prove that. He had this same kind of momentum and was a firebrand out on the trail. He preached a message of hope and social justice, and many of the same things Bernie’s articulating and inspiring people with today. Howard Dean was decidedly an outsider, and refused to play the game of Washington. He fashioned himself the liberal crusader, who was going to storm Washington and use intellect and the might of the right to change a broken system. Then came the Dean Scream, and his campaign was effectively dead in the water. I don’t expect Bernie will make the same mistake, but the parallels still remain. The analogy is this: it’s relatively easy to inspire and whip up the base into liking you. Of course his fundraisers and campaign rallies are overflowing with devoted Bernie acolytes. What would you expect? Those are the people who are supposed to love and respect him. He is the embodiment of all our ideals. He is the poster boy for liberal integrity and social justice. Sadly, those aren’t the people he needs to convince. It’s the rest of America. Very few extremists of note have ever won an election in this country. Many of you argue with me, and insist that Bernie is not an extremist, and actually is quite mainstream. You are sadly deluded. Maybe to you he is mainstream, because you drive a Saab and work as a professor at Middlebury, in Vermont, live in a 19th Century restored Victorian farmhouse, are active in the local green party, belong to a co-opt, act in your town’s local community theatre, and in the 1960s, you worked on RFK’s campaign and attended Woodstock. Sure, in your world, Bernie shares all YOUR middle of the road values. The reality, my friend, is that you live in a progressive cultural bubble of liberal hegemony, and Main Street, America does not take a left through Vermont. Sanders actually refers to himself as a Democratic Socialist. As I said earlier, to many in this country, he might as well have said he was an ISIS Communist. It’s not fair, and it’s not rational, but it’s reality. And this is a campaign of reality. Real lives are at stake. Rights of minorities and the health of every American. And as much as I’d like to live in the land of tomorrow, I think we enact change from within today. Hell, we just passed Marriage Equality and Affordable Healthcare. And who did that? It wasn’t some crusading liberal outsider with an eye to radical social revolution. It was very real justices who were appointed by a very real winning mainstream politician. That person began as a candidate, winning the hearts and minds of middle America, where Joe the Plummer lives, not Andy Warhol. It doesn’t mean radical artists and great visionaries aren’t welcome in the party. We need those people. But Americans want to vote for and elect someone who looks like them, and shares their same values. The reality of America is that most people fall somewhere in the middle. They distrust ALL politicians, but especially the loud and bombastic zealots from the extreme left and extreme right. Now, I’m not saying Sanders is zealous or radical liberal, but he is a self-described Democratic Socialist, and he favors policy proposals similar to those of mainstream social democratic governments in Europe, particularly in Scandinavia. That may not sound unreasonable or undesirable to us bleeding heart liberals, but to the average or slightly conservative American, he might as well have said he’d like to take away all of America’s guns or make Islam the national religion. To many people, socialism is a scourge to society, and spreads like the cancer of Communism — an even worse and more maligned term in this country. The opinion of many Americans is that socialists are anti-capitalism, and rely on taxing the well-earned money of hard-working Americans, in order to subsidize the poor, indolent, lazy, minorities, and otherwise unproductive leeches of society. They have falsely learned to distrust socialized healthcare, maternity and paternity leave, free education, patronage of the arts and museums, comprehensive welfare and government subsidies, and other social programs. They listen to scare tactics about how single-payer free and socialized healthcare is dangerous and kills thousands of innocent sick people every year, with its long lines and substandard quality and facilities. We have actually come to believe this preposterous propaganda. The point is, whether we like it or not, the truth is, the majority of Americans believe some version of this lie. 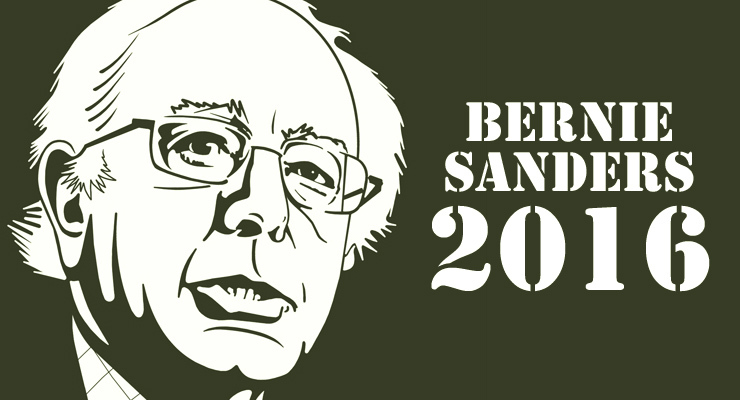 Socialism is a dirty and obscene word in this country, and that makes Bernie Sanders a dirty and obscene candidate. He believes in the fair distribution of wealth, corporate accountability, is a pacifist, argues passionately for social justice and for rights still divisive and threatening to many, can appear very anti-business, believes in far-reaching regulations, wants to completely overhaul campaign financing, seeks to heavily tax the rich, and many more controversial issues for voters. You can only deny the truth for so long. Bernie may be storming rallies and fundraisers now, and he may have already captured your heart, mind, and vote, but this is a flash in the pan and unsustainable. Liberals are such dreamers, and get so excited for moral crusaders and radical revolutionaries, we forget to vote for the candidate who can actually win us the White House. The one who actually signs bills, and actually appoints justices, and actually has their finger on the button and starts wars. We need to think in actual terms, in the real world, and who we can actually elect. Dreamers are great because they inspire and motivate the liberal base, but they’re rarely the ones who win elections. Even the unrealistic and improbable win of Barack Obama wasn’t as radical and unprecedented as we may think. Obama was relatively moderate, and had certainly called for change and made progressive moves, but he was still palatable for mainstream America. He was like the nice boy your daughter brought home for dinner. He was polite, well spoken, intelligent, funny, talented, and respectful of all your family values, even when he didn’t always agree. He had dignity and integrity, and Americans realized that. They saw a rags to riches story of one man overcoming impossible odds and an improbable ascent to the highest office in the land. His story was our story, and Obama embodied the American Dream. The color of his skin was more of an asset than a liability. We voted him in for his merit, but also because we collectively thought it was time, and a black man deserved to be President. Obama whispered quiet change, but spoke loudly for an America everyone could enjoy. He advocated justice, but ruffled relatively few feathers. He was acceptable to middle America, and for a brief time, Obama lived on Main Street, U.S.A.
Bernie Sanders is no Barack Obama, Most people think of Sanders as an elite educated New York Jew, who moved to Vermont and ran for office. They see him as a social activist, and do not see themselves in him. The Sanders we’re seeing selling out stadiums and overflowing campaign rallies is energizing the base and whooping up a frenzy in the left wing liberal demographic. But again, that’s NOT AMERICA. Sanders will face just as much distrust and scorn as Howard Dean did before him, and Ralph Nader did before that, and generations of far left extreme candidates, who keep the party honest and inspired, but ultimately cannot hope to win the highest seat in the land. Change comes from within, and in baby steps. The Republicans are pragmatists, and do what is ultimately best for the party, even if that means sacrificing a man who most embodies their message. Democrats need to start being just as ruthless with their candidates. As painful as it is for me to say, it is always about more than just one man. And I say that with the knowlege that the Civil Rights party most certainly would not have been the same without MLK and the 1968 Presidential Race would looked completely different without RFK. We likely would not have had Nixon, more Vietnam, and certainly not Watergate. Individuals CAN change the world. But most of them did it from within, as much as without. MLK used mild civil disobedience, but he met with the President and opposing leaders, and he used peaceful protest and civil law to achieve his goals. No war. No revolution. Just peace and ideas. More recently, gay and lesbian Americans have been working tirelessly for over two decades (at least! ), in an effort to win rights and change legislation barring them from marriage, inheritance, and discrimination in the workplace. They have achieved remarkable hate crime legislation and other protections, but the crowning achievement came last Friday, when they won Marriage Equality with a 5-4 Supreme Court ruling in their favor. It was a momentous and historic day. Yet it didn’t come about through radical change, or violent revolution. It came about slowly (actually, quite rapidly, compared to gender and racial equality). and it was achieved through measured legislative change and lobbying. It came about through winning the hearts and minds of the American public. Because some house wife started to watch Ellen, and “really liked her, even if she is gay.” They wore down our “traditional family values” as generations of black Americans had worn us down to prepare for Obama. He stands on the shoulders of giants, as do gays everywhere, stand on the shoulders of men like Harvey Milk. CHANGE COMES FROM WITHIN, AND IN SMALL GAINS. As much as we’d all like to immediately live in one nation, indivisible, with liberty and justice for all, it doesn’t work like that. Dream big, change small. It’s better than NOT getting elected, and not only being unable to make changes for the better, but have to suffer the Right making changes for the worse, and rolling back the rights and liberties we’ve won. We simply can’t afford another eight years of Bush III. That’s the reality. If Bernie can promise me that, then I’d love to vote for the man. And I likely will vote for him in the primary. But when it counts, I’m going to vote for who I think can win and protect and fight for my values and way of life. Voting my conscience is about more than just voting for one good man. It’s about voting for anyone who can ensure my way of life and the values I hold dear. My “conscience” sleeps just fine knowing my vote counted, and I put one of our guys in the only chair that matters.